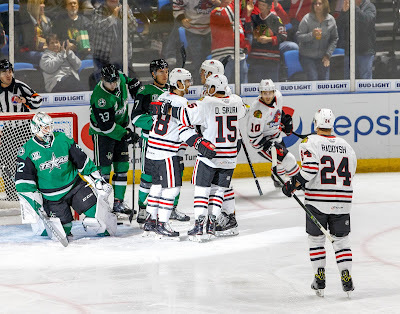 The Texas Stars couldn't spoil a home opener, falling to the Rockford IceHogs 5-3 on Saturday. 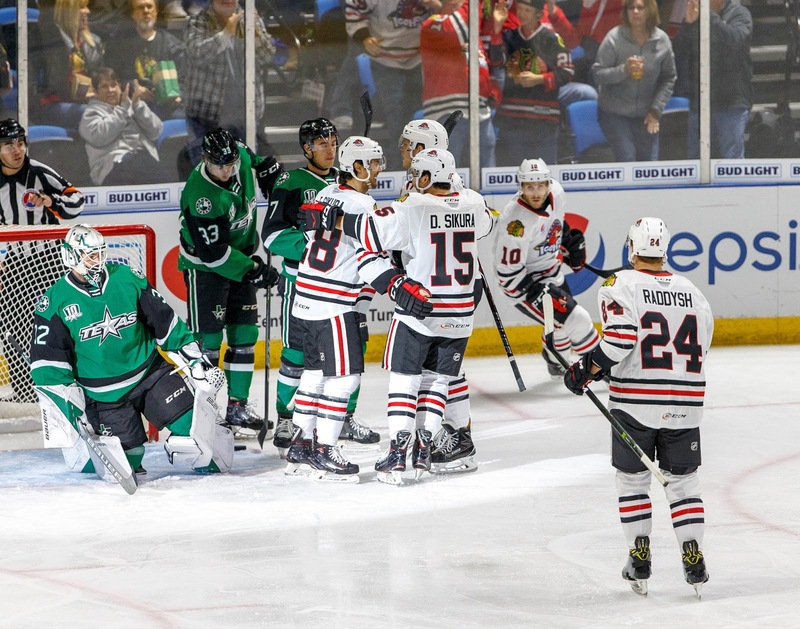 Justin Dowling, rookie James Phelan, and Denis Gurianov all scored for the Stars, but it was not enough to stave off the IceHogs, who had an answer after every goal. Colton Point got the start in net and recorded 30 saves on 34 shots. The IceHogs out-skated the Stars in the first period and drew three penalties to show for it. They captalized on their first power play within the first four minutes of the game when Tyler Sikura finished off his brother Dylan's rebound. Between killing penalties, the Stars responded with two goals of their own. Phelan scored his first professional marker with one of the prettiest plays you'll see in the AHL. After breaking out on the rush and receiving the entry pass from Colton Hargrove, Phelan pirouetted away from a back checker and roofed one on a scrambling Delia. The Stars finished the game 0-for-1 on the power play but took six total penalties. During their third penalty kill with just over seven minutes left of first period play, Point had to save his team's bacon with a perfectly timed kick save on a potential breakaway goal from IceHogs forward Graham Knott. It was a critical play that seemed to tilt the ice in the Stars' direction as they generated a 3-on-1 rush with less than a minute left in the frame. Denis Gurianov finished the play with his second goal of the young season. The teams traded a goal a piece in the second period. Henrik Samuelsson cleaned up his own rebound less than three minutes after the puck dropped to draw the IceHogs even. After that goal, Point was sharp where he needed to be, making a few sprawling saves on high danger scoring chances. One came from his belly after he gave up multiple rebounds. Near the halfway mark of the frame, Justin Dowling recorded his second goal of the season by deflecting Gavin Bayreuther's offering from the point. Matheson Iacopelli brought the game back to even with a back hander after a hard working shift by the Rockford fourth line near the nine minute marker in the third period. Rockford goaltender Collin was better than Point in the final frame, coming up with some of his own heroics to keep the game at even until Dylan Sikura notched his second point with a go ahead goal. Mixed in were a couple more penalties the Stars had to kill off, including 19 seconds of a 5-on-3. It was not a recipe for success in the late going, as they were unable to generate any kind of meaningful momentum. The IceHogs capped the game off with an empty net goal from defenseman Darren Raddysh. The Stars conclude their three game road trip through the Central on Wednesday against the Grand Rapids Griffins.